Italians produce elegant and timeless design whether it is clothes, sunglasses, cars or kettles. First comes the design, second the functionality. Every Alfa Romeo owner will vouch for that. If the ’50s, American diner style is your thing, the Smeg kettle should be right up your street. It combines the superb vintage look with all features of a modern variable temperature kettle. The pastel-green casing is made from “powder coated stainless steel” with the temperature control integrated into the base. It is worth mentioning that the temperature is shown in Fahrenheit and Celsius. The seven settings range from 106°F/50°C to 212°F/100°C which will keep all tea and coffee lovers happy. The kettle plays a little chime when setting the temperature or when it is finished. Make sure your doorbell sounds differently; otherwise you might run to the door every time you want to have tea or coffee. 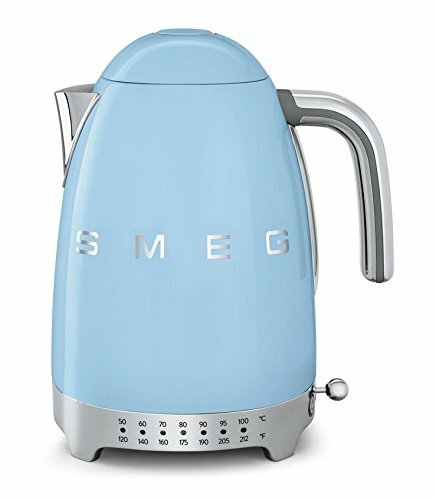 Smeg has a good range of other kitchen products, and therefore you could match the kettle with the style of your fridge, juicer, toaster, or even the entire kitchen. There is a button on the top of the lid which opens it very slowly (intended, not a malfunction). Once you fill the 1.7l, the kettle heats the water in about 7 minutes. To set the temperature press the button in the base beside the on/off switch and select the desired setting. There are seven temperatures to choose from. The little chime will tell you when the water is ready. The Smeg kettle comes with all features including little rubber feet to prevent it from sliding off your kitchen table. It is easy to use, good to handle and even better to look at. Suitable for a $$$+ budget. 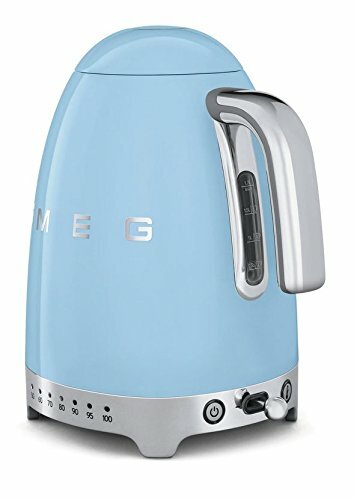 In the end, the Smeg kettle only boils water, like all the other, cheaper ones. However, it does it with style – 50’s retro style to be precise. Is it worth nearly $200 – probably not. Is it worth having one – definitely yes. That’s the difference between a lifestyle product and a necessity. 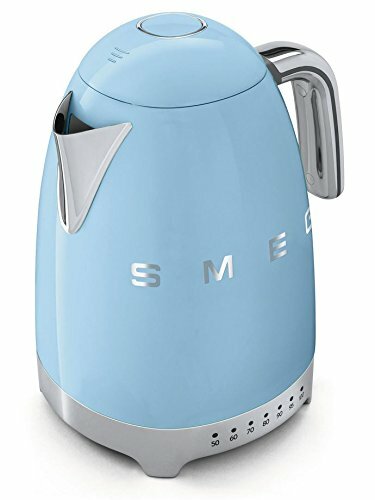 Smeg also offers this kettle in other colors or polished steel look.